Home › Uncategorized › How to make every day a Valentine’s Day! How to make every day a Valentine’s Day! As February comes to a close, I noticed all the red hearts gone from the stores and the Easter-spring merchandise popping up! I kind of liked having a holiday revolving around the theme of Love. And I’m a bit sad to see it all go! There are many ways to express love to those you care about and that are close to you. Just being there for someone and listening when they are having a tough day is huge. Yes, there are the showy things like flowers and chocolate (for those of us who are not dieting!) And, yes, Valentine’s Day can be considered a Hallmark Holiday (meaning we all support the card companies!) What do you want to take away from this holiday? I think it more meaningful to give a card when you want to express gratitude or just “thinking of you”. One should not underestimate the element of surprise. Of course we are expected to remember birthdays and anniversaries. However, romance comes from when a gesture is given and for no particular reason except to make someone’s day. We get busy during the year. How can we remember to add the little touches to our friends and loved one’s lives? As you go about your day, if you see something that reminds you of someone, or think someone needs a pick me up, then my relationship advice to you is to buy (or make) that something and give it to the intended person. How about making a CD of someone’s favorite music? (or emailing downloads for her ipod!) If it’s for a serious relationship such as a girlfriend of boyfriend, then it will be considered very romantic. You don’t have to wait until Valentine’s Day 2010 to be romantic again or show those close to you that you value having them in your lives. How about buying (on sale now) those cute little Be My Valentine cards and giving them out to your grandmother, niece or nephew, best friend and girlfriend/boyfriend all throughout the year? They will be truly touched. What will you do to keep the spirit of Valentine’s Day going all throughout the year? Who in you life can benefit from your mindful efforts? This inquiring relationship coach wants to know your answers to these questions and any comments you may have on this subject. P.S. Get your relationship questions answered! Subscribe to my ezine for helpful dating and relationship advice and tips to move you forward towards your goal of meeting a partner for a committed serious relationship or to enhance your existing love relationships at www.heartmindconnection.com . 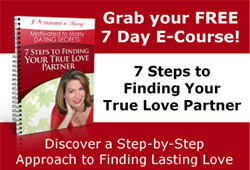 Download a free chapter from my book, Get It Right This Time-How to Find and Keep Your Ideal Romantic Relationship at www.GetItRightThisTime.com.